Blue Sky Alpacas has announced their Spring 2013 Metalico Wrap collection. 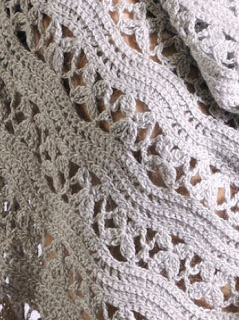 Among the three beautiful wraps is my beautiful brown, floral-lace, crocheted Daisy Wrap. The pattern is written for three different sizes, using 5, 7 or 9 hanks of Blue Sky's Metalico (baby alpaca and silk) yarn. The sample is shown in the largest size. The pattern includes a chart and written instructions. I recommend following the written instructions and using the chart as a guideline for how the stitches relate to each other. Something a little fun about this design is the blocking… I think it's essential to block this wrap. Before blocking the wrap is very bouncy and the lace pattern remains hidden. As you can see in the photo, it stretches a ton when pinned out to block, and the lace pattern really opens up. The first few rows of this wrap required a lot of my attention, but as I figured out the stitch pattern and was able to work on it from memory instead of referring to the pattern for every stitch, I happily buzzed right along. This was one of those finished projects that I was sad to send away. It's definitely something I'd love to have for myself.